We all want to look gorgeous and glam in seconds. In this world of being "on" 24/7, we don't have time to spend an hour on makeup. COVERGIRL took the task of becoming instaGLAM literally and created some makeup products to help us busy women get that gorgeous look quick. You may have seen the COVERGIRL instaGLAM commercial or remember my instaGLAM preview a few months ago. I have my hands on the collection now and had to show off the pretty products and share my thoughts. The instaGLAM collection includes just about everything you need in makeup for a glamorous look fast. To get started there is the Ready Set Gorgeous Foundation ($6.99), in a liquid/creamy version and a powder version. The creamy version feels like a tinted moisturizer on the skin but it offers more coverage than a tinted moisturizer would. It feels very light and breathable on the skin and blends in easily. I like to apply it with a brush for medium coverage or a damp beauty blender sponge for lighter coverage. It get a good 8 - 10 hour wear out of the foundation and am quite pleased with it. It has a semi-matte finish that look natural on the skin. For more coverage, I like to set it with the Ready Set Gorgeous Pressed Powder Foundation ($6.99), similar as to how I use MAC Studio Fix Powder Foundation or Lancôme Dual Finish Powder Foundation. Ready Set Gorgeous Pressed Powder Foundation can definitely be worn alone, but my skin is so dry that I rarely wear straight powder foundation. I think this is great for those with more oily skin or those without flaws (like lines). My daughter really likes it and dampens the sponge to apply. The finish is very natural looking and it does cover. It can be built up to a medium coverage and it does last too. I really like the Ready Set Gorgeous Concealer ($5.99). I am really impressed with it and I could tell I liked it as soon as I swiped it on with the sponge tipped applicator. It is thicker and it grabs onto skin and covers really well. It doesn't crease under my eyes or settle into my fine lines, which I really appreciate. This concealer lasts all day under my eyes and I am more than thrilled with it; I've been using it everyday. Eyes are bolder than ever and ready quick too with the updated Bombshell Curvaceous Mascara ($9.49). This is the same formula as the original Bombshell mascara but Curvaceous comes with a curved brush that pushes up lashes to create curl along with volume. If you haven't tried the original, Bombshell Mascara is a two step mascara with a volume basecoat plus a dark, intensifying top coat. The result is over the top, gorgeous lashes. The instaGLAM collection rounds out with 13 delicious shades of Colorlicious Lip Gloss ($5.99). These over the top, highly pigmented shades condition lips as you wear it. It seriously feels really great on the lips, but weightless at the same time; not sticky or heavy. It offers a lot of color and a lot of shine. The flavor is a super sweet vanilla that is as addicting as are the shades. I love Plumilicious, Candylicious and the succulent Sweet Strawberry. For what I thought was a collection geared toward the teen set, this over 40 year girl is impressed! 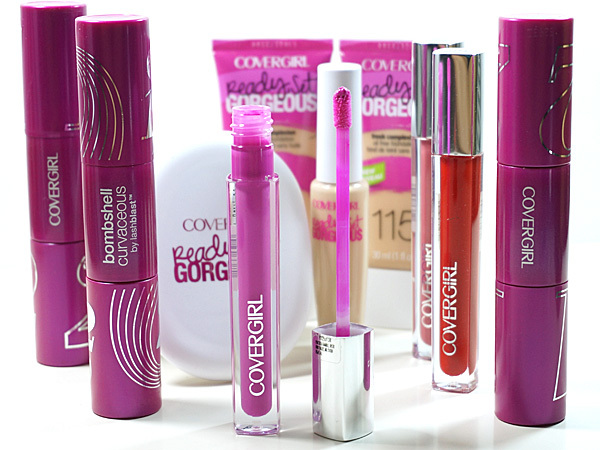 Look for the COVERGIRL instaGLAM collection at your favorite drugstore or mass retailer now. Maybelline The Nudes Palette Review.